Maria's Mélange: Crenshaw - by Applegate Review and Giveaway! 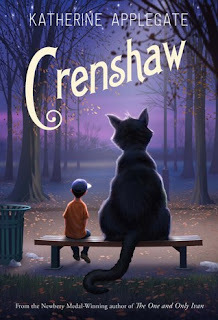 Crenshaw - by Applegate Review and Giveaway! Crenshaw is timely, yet also timeless. So many kids are struggling in families who are just barely making ends meet. This is something that, unfortunately, is a very timely topic. Yet there are not so many "current day" references that this book won't also help kids in the future who face similar challenges and fears. The writing is excellent. I loved the way Applegate describes everything. She has such poetry and fun in her writing and word choices. The rich language is perfect for my student population - upper elementary students with strong vocabulary. "Dad says his uncle was a charming curmudgeon, which I think means grumpy with some niceness thrown in." A frequent complaint about middle grade books is that we have to lose a parent - or have awful parents - to give the protagonist the space to grow. This is a fabulous example of a child who grows and learns AND has a loving set of parents, a realistic sibling bond, and a close friend. I loved the relationships in this book, and I think my students are also going to love them. "I like facts. Always have. True stuff. Two-plus-two-equals-four facts. Brussels-sprouts-taste-like-dirty-gym-socks facts. Okay, maybe that second one's just an opinion. And anyway, I've never eaten a dirty gym sock so I could be wrong." How could you NOT love that kid? So far my students have only seen the cover and heard me talk about the book. Still, I got immediate responses of "I want to read that!" and "I'm putting that one on my list!". You need to put this one on your list. I know I'm going to make sure I have a few copies of Crenshaw in my classroom library! 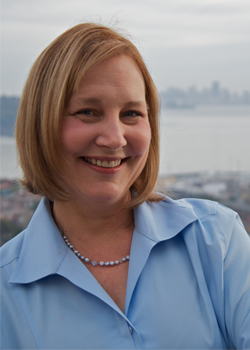 Katherine Applegate is the author of the bestselling Animorphs series and the novels Home of the Brave and The One and Only Ivan, winner of the 2013 Newbery Medal. She lives with her husband, author Michael Grant, and their two children in Northern California. You can read a post Katherine Applegate wrote for the Nerdy Book Club for Crenshaw's book birthday here! Let's keep it simple, shall we? Just enter your name and email address in the form below. I'd love if you left a comment, but it's not required.